We are so excited for today. We have been busy the past month creating something fun to share with you to put in your homes. 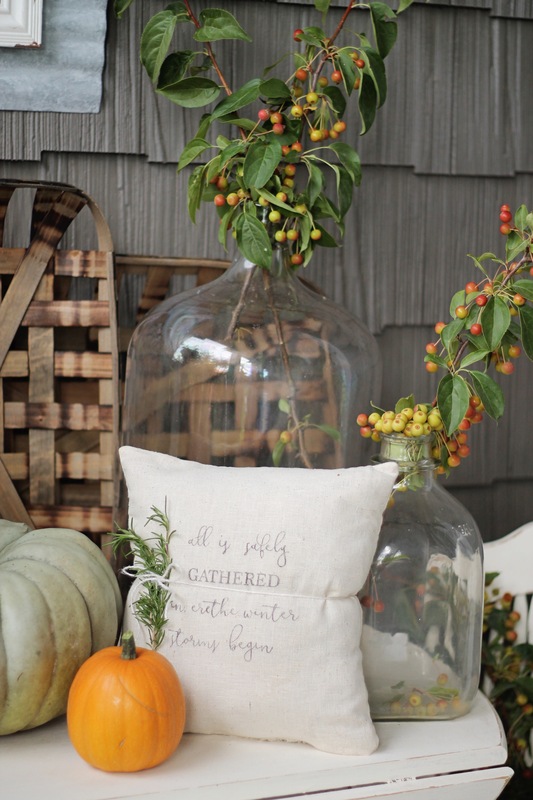 We love fall, and decorating for fall is always something we look forward to. We have created this free printable for you. 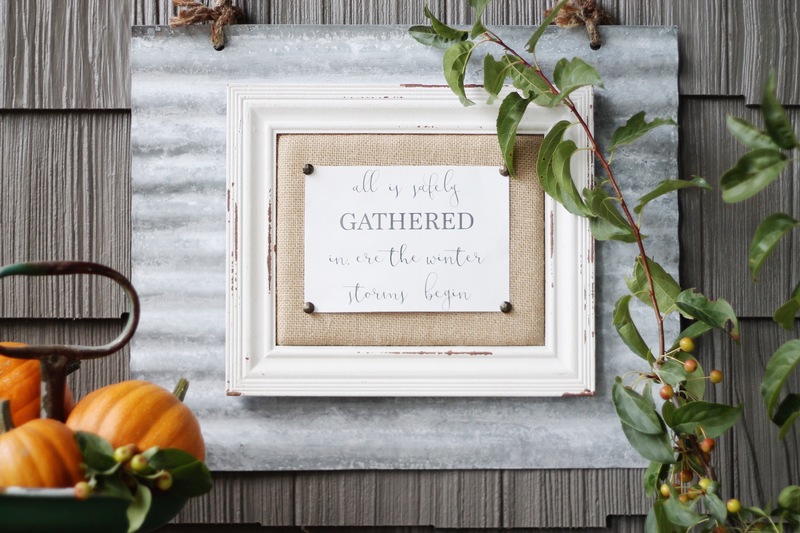 We have teamed up with 35 other bloggers that have also created beautiful printables for fall. (Check them out at the bottom of the post). We would like to thank Kristen from Ella Claire for inviting us to this fun collaboration. For our printable we went with the lyrics from the hymn, Come, Ye Thankful People. The Line “All is Safely Gathered in, Er the winter storms begin” really stood out to us. This song was written in 1810 so many people literally had to gather and prepare for the winter time. Now days not all of us may harvest and prepare for winter like they used to but many of us do in a way. Currently we are gathering vegetables from our garden to store for the winter time. We harvest our onions and potatoes, keep them in our cool basement and eat them all winter long. We also stay busy in the fall canning and preserving fruits and vegetables to eat the following year. Our favorite things to can are pickles, tomatoes, grape juice, peaches, nectarines, and salsa. Isn’t fall such a fun time to gather, harvest, and preserve produce? Once we decided on the quote and created the printable we had the fun part of styling it. We styled this printable in two different ways. Our friend, Patty, gave us the idea to use these galvanized sheets. We found them at Walmart with the strings attached to them already. They originally were really shiny but we wanted a rustic look. So we weathered them using hydrogen peroxide, salt, and the sun. They turned out the way they are in the pictures and we love them. We had this frame that had burlap in it already. We then glued the frame to the galvanized sheet and pinned our printable to the frame with upholstery tacks. We think it has a perfect fall look to it. 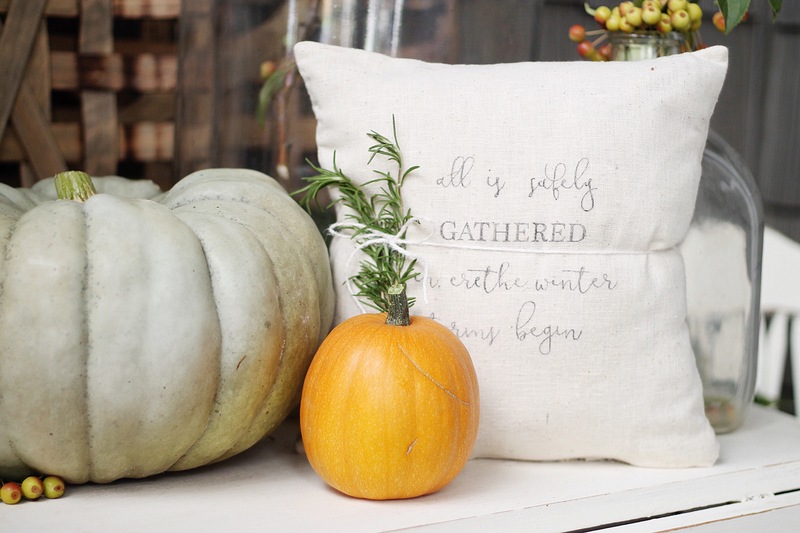 The second way we styled our printable was on this adorable pillow. We mirrored the printable and printed it. We have included a mirrored image of our printable if you want to create this pillow. A step by step tutorial on how to make this pillow can be found here. Its one of our favorite things that we have learned how to do, so get excited! Once we had the image transferred to the fabric we tied a piece of rosemary to it. We styled the printable outside on the front patio. You could do the same or create this look inside your home as well. 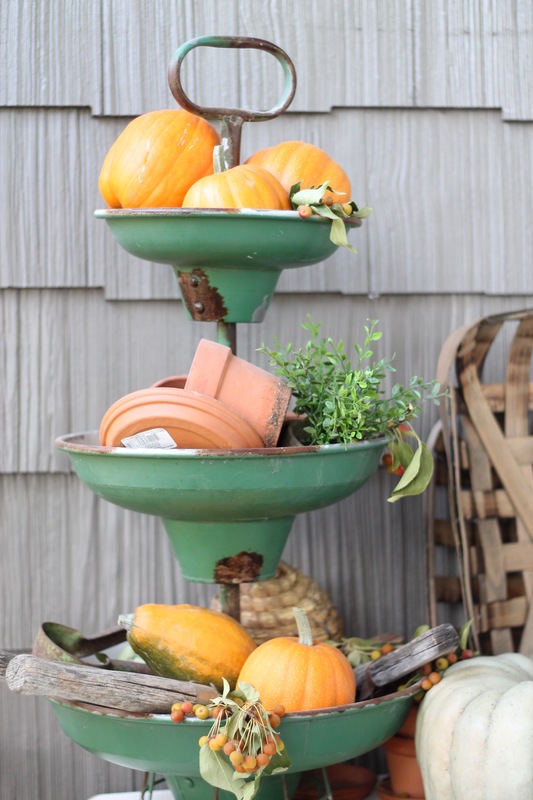 We picked our first pumpkins from the garden and placed them on the table, floor, and the green tiered stand. It wouldn’t be fall decorating if you didn’t have pumpkins, right? Another thing we did was place branches that had these fall colored berries on them in our glass bottles. We also placed some of the berries around the table to add some extra fall colors. We hope we have inspired you to decorate for fall and use this cute printable in some way. Download the free printable HERE If you would like the printable mirrored to transfer to fabric download it HERE. We feel honored to be part of a fun series of free printables. Go check out all of these adorable printables for fall. You are going to love them.